Isn't it high time Vermont mellowed out its marijuana laws? It was almost exactly a year ago when members of the House Health and Welfare Committee gathered in a crowded hearing room in Montpelier to debate the pros and cons of legalizing medical marijuana. Lawmakers spent a week listening to dead-serious testimonials about chronically ill Vermonters of all ages and political persuasions who use cannabis to relieve the symptoms of their persistent and intractable medical conditions. Opponents of the bill — primarily drug-enforcement agents — issued dire warnings that state-sanctioned medical marijuana would open the door to out-of-state gangs, organized crime, large-scale drug trafficking, elder fraud and even deadly turf battles between rival drug dealers. Offsetting the long hours of sobering testimony were a few lighter moments. During the breaks, committee members occasionally joked about pot-laced brownies and passing around joints of the "wacky tobaccy" to see what "the buzz" was all about. No one raised an eyebrow at these candid moments of silliness, though they revealed what even the most straightlaced representatives in the room knew about pot's mellow nature. It's hard to imagine those same politicians spending a week discussing Vermont's problems with heroin and cocaine addiction, and then giggling over lunch about shooting smack or snorting lines. 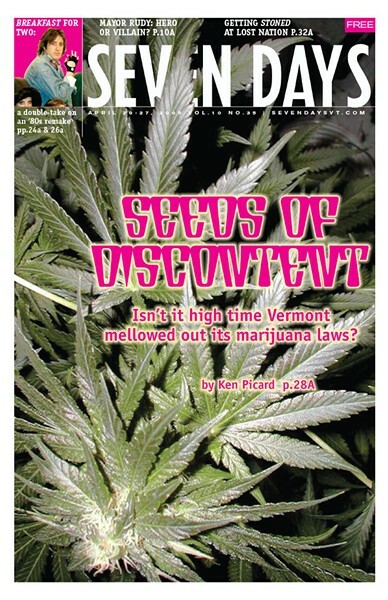 And therein lies a fundamental truth about Vermont's dazed and confused approach to marijuana: On the one hand, many politicians, judges, doctors and police officers concede privately that the personal and societal harms caused by pot are modest compared to the effects of other illegal drugs such as heroin, cocaine and methamphetamine, and tobacco, alcohol and other legal substances. Moreover, most acknowledge that efforts to eradicate weed from the Green Mountain State have been a costly and abysmal failure. On the other hand, few policymakers have been willing to put forward a serious alternative to pot criminalization out of fear of being labeled "soft on drugs." Until recently, that is. Last month, Representatives Winston Dowland (P-Derby Line) and David Deen (D-Westminster) introduced legislation to end Vermont's 90-year-old prohibition on pot. The bill, H.390, would establish a system for taxing and regulating the growth, sale and distribution of marijuana. The bill calls for removing the criminal and civil penalties for possession, in nonpublic places, of up to 1 ounce of marijuana for adults over the age of 21. It would increase the penalties for selling dope to minors. The bill would also dedicate one half of the revenues raised by the taxes and licensure on ganja dealers to the prevention and treatment of drug, tobacco and alcohol use. Vermont's recreational pot smokers should hold off on the celebratory bong hits for the time being, however. Even the bill's sponsors readily admit that with heavyweight issues such as Medicaid on the legislative plate, marijuana legalization isn't exactly a smoking issue among lawmakers. In fact, no one really expects this bill to make it out of committee. But as the initiative's lead sponsor explains, that's not the point. Dowland believes it's high time Vermonters began an honest dialogue about the true costs of marijuana prohibition. "We need to open up the discussion and find out what we're doing wrong, because what we're doing now isn't working," Dowland asserts. "Everybody wants to talk about it, but nobody wants to put their name on a bill." The Progressive lawmaker from the Northeast Kingdom isn't some dreadlocked, pot-smoking Phishhead. Dowland, 62, is a retired mail carrier and welder who sports a gray crewcut — a vestige of his years in the Navy and five tours of duty in Vietnam. He now works with high school students enrolled in the Naval Reserve Officer Training Corps and is an ardent opponent of pot smoking, especially among kids. But after talking with Vermont's drug-war veterans, Dowland believes that marijuana interdiction is a lousy use of law-enforcement personnel, time and resources. "I had a Border Patrol guy come up to me the other day in the Northeast King-dom and say, 'Thanks! We're wasting so much time with mere possession that it's ridiculous,'" Dowland notes. "'We have to waste time stopping somebody with a pipe in his pocket. What the hell is that?'" It's tough to argue that Vermont's campaign to stem the dope trade has been remotely effective. At least once a month, the U.S. Attorney's Office in Burlington issues a press release about a plea deal or conviction for a large-scale marijuana growing or smuggling operation. Just last week, for example, 49-year-old Harry T. Nuckols of Victory pled guilty to cultivating more than 100 marijuana plants, as well as to possession of firearms and $35,000 in cash. Nuckols faces a mandatory minimum sentence of five years in prison on the cultivation charge alone. A month earlier, Christopher Tetrault, 34, of Essex Junction, and Eric Veys, 34, of Eastman, Quebec, were sentenced for smuggling more than 100 kilos of pot across the U.S./Canada border. They, too, were in possession of firearms and large amounts of cash. Veys, the operation's ringleader, was sentenced to 10 years in prison. Marijuana busts like these rarely make the news anymore unless violence ensues — as in June 2003, when a pot smuggler trying to evade arrest on Interstate 91 ran down and killed Vermont State Police Sgt. Michael Johnson — or if the quantities seized are unusually large. No one knows for sure how much weed is grown in Vermont or is smuggled across its borders. The state's Marijuana Eradication Resource Team reports that the state police seize about $15 million worth of plants and processed pot each year. But if Vermont's seizure rates are consistent with national trends, that amount could represent less than 20 percent of the total marijuana being consumed in the state. In 2002, the National Drug Intelligence Center reported that the value of Vermont's marijuana crop rivaled the state's legal agricultural output. Three years later, it's a safe bet that cannabis now ranks among the largest cash crops in the Green Mountain State. Despite the most diligent efforts of state and federal drug-enforcement agents, marijuana remains Vermonters' most popular and easily accessible illegal drug. In 2001, the Office of National Drug Control Policy reported that the cost of pot in Vermont ranged from $180 to $250 an ounce, a price that has remained fairly constant over the last decade. Among Department of Corrections inmates, marijuana is far and away the preferred drug of choice — and a leading cause of probation and parole violations. The 2000-'01 National Household Survey on Drug Abuse found that about 28 percent of Vermonters of all ages describe themselves as at "great risk" of smoking marijuana at least once a month — a rate that's among the highest in the nation. The prevalence of pot smoking among Vermont teens is even greater. The 2003 Vermont Youth Risk Behavior Survey found that one in four students in eighth through twelfth grades reported that they'd puffed herb in the previous 30 days; nearly nine in 10 said that it's easy for them to score a bag. And while the latest numbers seem to show that fewer Vermont youngsters are hitting the pipe, it's also true that the older they get, the more tolerant and accepting they are of pot smoking. In 2003, 81 percent of Vermont's 8th-graders described marijuana use as "wrong or very wrong." By 12th grade, however, the percentage describing it that way had dropped to 46 percent. It's not surprising that, according to the U.S. Centers for Disease Control and Prevention, more Vermont teens now smoke pot than cigarettes. Clearly, the state's pot-prevention efforts are getting only mixed results at best. And the threat of criminal prosecution doesn't seem to be much of a hindrance, either, even though the punishments for possession in Vermont can be harsh. A first-offense conviction for possession of up to 2 ounces of marijuana is a misdemeanor, punishable by up to six months in jail and a $500 fine. But a second offense for possession of up to 2 ounces of dope is a felony, punishable by as much as two years in prison and a $2000 fine. Possession of 2 ounces to 1 pound, even on a first offense, is automatically a felony and can land a person behind bars for up to three years, as well as saddled with a $10,000 fine. The punishments get increasingly severe from there. How aggressively does the state pursue jail time for simple possession of grass? The answer depends upon whom you ask. Reportedly, the state eschews prison time for possession alone. But in 2003, Vermont disposed of 1785 marijuana cases, 87 percent of which were for misdemeanor possession of less than 2 ounces. In 2004, 255 people were sentenced to prison for marijuana-related convictions, 171 of which were misdemeanors. With the cost of incarcerating inmates hovering at around $34,000 per year, even those relatively small numbers add up. "There is a tremendous amount of collateral damage, if you will, by marijuana prohibition," says Nancy Lynch, statewide organizer with the Vermont Marijuana Policy Project, a national organization that endorses the liberalization of U.S. marijuana laws. "While people think that people are not being arrested and sentenced to prison in Vermont [for possession], in fact, they are." Lynch is now participating in a statewide effort to revisit Vermont's approach to drug use. About a year ago, the Vermont Bar Association launched the Drug Policy Project, a broad coalition of lawyers, doctors, agency heads, law-enforcement agents, drug-treatment counselors and others who are evaluating the effectiveness and shortcomings of Vermont's current drug policies as they relate to treatment, prevention and criminal justice. Kevin Ryan is director of education and communication at the Vermont Bar Association. "The primary goal [of the Drug Policy Project] is to reduce the harm that's caused by drug use in society," he says, "recognizing that harm can be caused not only by the people that are using drugs and selling them, but by the way we respond to that." Thus far, the Drug Policy Project hasn't put forward any legislation or other specific proposals, though Ryan says it has taken the general stance that drug abuse in Vermont is a medical issue, not a law-enforcement or corrections issue. That position is consistent with statements made last year by Public Safety Commissioner Kerry Sleeper. Vermont's top cop opposes efforts to liberalize the state's marijuana laws, though he has publicly acknowledged that the state's drug-abuse problems cannot and will not be solved by law enforcement alone. Apparently, other Vermont cops share that view. The activist group Law Enforcement Against Prohibition, which advocates for ending the drug war and diverting those resources to treatment, education and prevention, claims at least a dozen members from Vermont's law-enforcement community. Back in 1978, then-Representative Jim Douglas was one of 75 House members who supported a marijuana decriminalization bill. But as governor, Douglas refused to sign the medical-marijuana bill into law, despite polls showing that Vermonters supported it by a wide margin. The medical-marijuana bill became law anyway, though it was restricted to patients who suffer from HIV-AIDS, cancer and multiple sclerosis. As of March 16, only seven Vermonters had signed up for the state's medical marijuana registry. Zuckerman's current bill would expand the list of who may register to use medical marijuana, and would move the registry out of the Department of Public Safety. It isn't likely to go anywhere this year, either. And the doom-and-gloom predictions about a dope-fueled crime spree still haven't materialized. And yet, stigmas about the demon weed continue to linger over the Green Mountain State. Vermont's marijuana policies seem caught in a '60s time warp, wrapped up with images of Vietnam War protests, Kent State and naked hippies dancing at Woodstock. Last week, when University of Vermont President Daniel Fogel sent an email letter out to all UVM students imploring them not to participate in this week's annual 420 marijuana smoke-in on campus, his plea made no mention of pot's potential health risks, only the harm that would befall the university's national reputation and prestige. The message wasn't lost on many UVM students. As is often the case, the debate over marijuana is more likely to be about appearance than substance.